The timing for release of this book could not be better. The debt ceiling's claimed deadline approaches as Congress wrangles over how or whether to confront the consequences in a meaningful — if politically risky — way or take the easy course of running up the national credit card yet again. 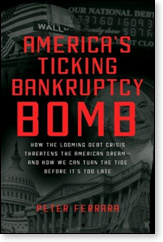 In "America's Ticking Bankruptcy Bomb: How the Looming Debt Crisis Threatens the American Dream and How We Can Turn the Tide Before It's Too Late," Peter Ferrara warns that the old game of getting past the next election will no longer do. The metaphoric "ticking time bomb" is about to explode if we do not disarm it, writes the author, who served in Ronald Reagan's White House Office of Policy Development and as associate deputy attorney general for President George H.W. Bush. He currently holds policy and legal positions with the Heartland Institute, the Carleson Center for Public Policy and the American Civil Rights Union. Bad enough that during President George W. Bush's eight years in office, America abandoned every one of the major planks of Reaganomics, Mr. Ferrara laments. Moreover, President Obama has "accelerated into hyperdrive even more in all the wrong directions," proposing policies that would in one term create a debt that exceeds that of all other presidents, from George Washington to George W. Bush, combined. This fact-crammed volume is the result of endless research by an author who writes very much the way he talks. The encyclopedic information rolls off the tip of his tongue as easily as he commits it to paper. Our nation's current path, if unchecked, will lead to an America whose status will resemble what many historians attribute to the economic and cultural decline experienced in Europe's Dark Ages. Many others have outlined the choices before us. Few have explored the political dilemma in such detail. Entitlement reform is a big issue with Mr. Ferrara. He ventures beyond the $15 trillion in future cuts in Medicare payments to doctors and hospitals, which "will create chaos in health care for seniors." Dare one murmur the words "death panels"? More to the point, the author notes, "Drug companies would ultimately cut back on investments in cutting-edge curative, pain-relieving and life-saving miracle drugs," and many will die needlessly as a result. The book's 64-page chapter "Obamacare: Death and Taxes" accords the president's plan the moniker the late economist Milton Friedman applied to socialized medicine in general: a "black hole," with everyone paying more and more for less and less. Mr. Ferrara finds it worrisome that some of those advising Mr. Obama on health issues have expressed cavalier attitudes likely to alarm the elderly and disabled and their families, suggesting health care efforts should be greatly dependent on the patient's perceived worth to society in general. He cites Dr. Ezekiel Emanuel, for example, who has been quoted as saying that doctors should look beyond the needs of their patients and consider "social justice" by not guaranteeing health services to patients "who are irreversibly prevented from being or becoming participating citizens," such as those with "dementia." Mr. Ferrara was putting the final touches on his volume just as House Budget Committee Chairman Paul Ryan was releasing his own Path to Prosperity budget proposal, which passed the House with just four Republicans voting no. 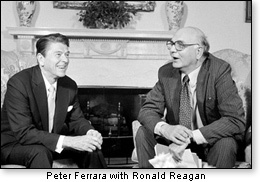 The author has kind words for the Ryan effort, but unlike the Wisconsin congressman, Mr. Ferrara also takes on Social Security and recommends personal accounts, which, he contends, would result in "prosperity for all." This is not unlike the program originally offered by George W. Bush in 2005. Mr. Ferrara says Mr. Bush's White House Social Security policy staff fumbled by switching the administration's conception of reform from "the positive populist model" to a "Pain Caucus model" that included benefit cuts and tax increases. At one point, he alleges, the president himself made a "highly confusing and forgettable appearance" on national television, and the public "had no idea what he was talking about." Public support then dropped to between 25 percent and 30 percent. In labor relations, Mr. Ferrara recommends unprecedented "Prosperity Unions" wherein the dominant question to the employer is, "What can we do to be more productive so you can pay us more?" The author envisions a "new civil rights" agenda, including (but not restricted to) school choice, patient power and job offers guaranteed to the able-bodied, with a private job assignment as the "top priority." Add reforms at the state and local level and a Reagan-like "peace through strength" foreign policy, and the end result is Peter Ferrara's vision of an America the Founding Fathers had in mind when they wrote the document creating a new nation like no other. This ambitious formula, this book argues, would mean "a rebirth of America" and future generations sharing "not panic, but hard-earned prosperity and peace."